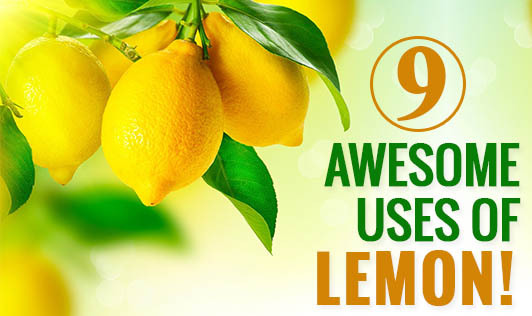 9 Awesome uses of lemon! Lemons....!! One of the most easily and commonly available fruits in the Indian market, provides a number of health benefits to our body. We have always been using lemon for that extra punch in the food while cooking, but uses of lemon don't limit to cooking, you can include this vitamin C rich citrus fruit as a part of your beauty regimen too. Here are 9 awesome uses of lemon you should know about. 1. Treats blackheads- Lemons contain alpha hydroxyl acid which helps you exfoliate skin and clear clogged pores. All you need to do is rub the sliced lemon all over your face, wait for five minutes and rinse it well with cold water. 2. Lightens acne scars- Citric acid in lemon helps you lighten your old acne scars. Just soak cotton in freshly squeezed lime juice and rub it over your face a couple of times in a day and rinse it off. 3. Helps you strengthen nails- To strengthen your nails, soak your fingernails in lemon juice for 10 minutes and rinse well with warm water. 4. Bleaches discolored armpits and elbows- Lemon is a natural bleaching agent. You need to rub a cut lemon slice on armpits and elbows to lighten them. 5. Gets rid of dandruff- This is the most well-known benefit of lemon. To eradicate dandruff, add 2 tablespoon of lemon juice to 1 cup of curd and apply the mixture on your hair. Rinse your hair with lukewarm water after 30 minutes. 6. Helps you get rid of oily skin- Just wipe your face with lemon juice dipped cotton swab before going to bed and wash your face the next morning. 7. Excellent teeth whitener- Lemon naturally helps you whiten your teeth. Make a mixture using baking soda and lime juice. Dip your brush in this mixture and apply it on your teeth and rinse immediately. Make sure you don't keep the mixture for more than a minute as prolonged contact can break your tooth enamel. 8. Protects skin from sun damage- You can prevent skin damage and wrinkles by using lemon. Make a face pack using 3 tablespoons lemon juice, 4 tablespoons curd and 2 tablespoons honey and refrigerate it in a container. Apply it on your face once or twice a week. 9. Helps you moisturize and lighten your skin- Mix 1tsp of lemon with 1tsp of coconut water and apply it on your face. Coconut helps you hydrate your skin and lemon brightens it. Hope you try these easy home remedies, however, if you have any issues with skin, hair or nail, please seek approval from your health expert before using it.